I am just pondering how quickly time passes by. It's almost like water slipping through your fingers in cupped hands. Everybody rich and poor, young and old, white collar, or blue collar all have the same amount of time in the day. No one rich person can add another hour to the day. Bill Gates once said that if he could buy anything, it be more time. I believe that the time we have is like an investment. You have it now, how can we use it to make the most out of it? One of my goals is to become a better time manager. A while back, I bought a book by John C. Maxwell titled "Today Matters." The book comes with questions after every chapter. Each week, I'll post my answers to the questions on this blog for each chapter. Hopefully, I'll be consistent with this being there are people who read this and are giving me an earful of grief for not updating this. So HERE!!!! HAPPY?!!! Nah, nah, thanks for reading this and for keeping me accountable for writing. -Awwwrright! The feeling I had after I received this letter is tremendous. I honestly could have died at the moment and said my life was meaningful. There is no price you can put on something like this especially since it was written by a third grader in my group. I read a book about writing a mission statement for you life, and one of the tasks was to clarify your values, among them, I put down to be understanding, and to be patient with people. 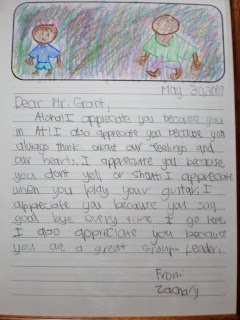 This letter clarified that value and showed me that others see it in me. When I received the letter, I framed it and it currently is on my wall. I look at it as a source of encouragement. A Thank You goes a long way. It shows people how much you care. Thank someone today.